Some months ago, the brilliant @WomensArt1 account tweeted an image of a small linen jacket embroidered all over with lettering. They explained it had been created by a woman forced into an asylum in the 1800s, who had stitched her life story onto her clothing. 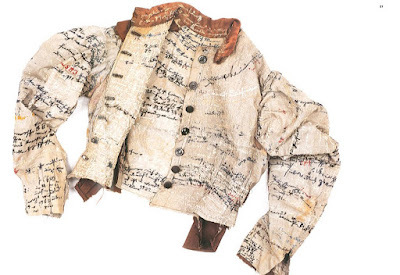 It seemed an extraordinary item, so I determined to find out more about the jacket and the woman who created it. The woman was Agnes Emma Richter, born in March 1844 near Dresden, Germany, and who made her living as a seamstress. In 1893, police admitted Agnes to a local mental institution because of complaints from her neighbours. It seems she told them that people were plotting to steal her money and she ‘believed her life to be in danger’. This led to a diagnosis of paranoia. Increasingly angry and ‘non-compliant’ with her incarceration, she was transferred in 1895 to Hubertusberg Psychiatric Institution near Dresden. The admitting physician described Agnes as a ‘poorly-nourished pale woman with very animated eyes and facial expression who looks old for her years.’ On admission, Agnes would have been stripped of her possessions, dressed in the uniform of the institution, and forced to submit to its rituals. It was perhaps in an attempt to retain her identity and her memories that she began to sew lines of writing into the linen jacket she was given. The lines of overlapping red, yellow, blue, orange and white threaded text are almost impossible to read. 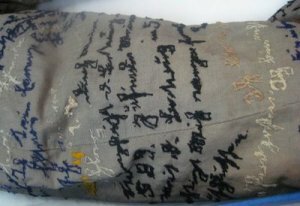 Many were sewn on the inside of the jacket and have worn away with use. In some places the thread has unravelled. However, several phrases have been deciphered, including ‘I am not big’, ‘I wish to read’, ‘my jacket’, ‘my brother,’ 'no cherries', ‘I am in Hubertusburg’ and ‘I plunge headlong into disaster’. Her hospital number, 583m, appears repeatedly. It is clear that Agnes wore the jacket, as it bears marks of use, including sweat stains. It also has a darted back, which may be an alteration for what her recovered files described as a deformity. Anna Mazzola is a writer of historical crime fiction and Gothic fiction. Her first novel, The Unseeing, is about a Victorian seamstress convicted of aiding a murder. What a sad story. But at least she had her say, and some of what she wrote can still be read.